Unique for its ventilation system and adapting lens, this model allows you to leave your sunglasses at home on backcountry pursuits. We waited impatiently for the Julbo Aerospace to arrive. A movable lens to maximize ventilation? Our backcountry hearts went aflutter. In the field, this unique function proved useful. Popping open the lens 1 cm from the frame eradicated the potential for fog formation, even in warm and wet conditions. The lens itself is high-quality and adapts to varying light conditions well. This model only comes with one lens, though, and Julbo USA doesn't sell individual lenses for this model. This is only an issue in white-out conditions and brilliant bluebird days. For the vast majority of days on the mountain, the lens is completely ideal. With the addition of moving parts, there is a concern for this pair's durability. Yet during testing, it survived a not-insignificant face plant at high speed. While this model is quite the ventilator, it's a more specific use (or user) tool. For premium all-around performance, check out the Editors' Choice-winning Anon M4. Julbo is a lesser-known brand in the snow goggle market, but their Aerospace model has several unique features that set it apart from the competition. We were intrigued by both the unique pop-out lens ventilation system as well as their Reactiv photochromic lenses. We put the Aerospace to task against the best goggles on the market, read on to see how they compare to the competition. Tree-skiing inbounds under eye cover of the Aerospace goggles. The Aerospace only comes with one lens. Luckily, Julbo makes it count. We tested these goggles with the Snow Tiger Photochromic lens. Incorporated into the lens is REACTIV technology, which adapts to varying light conditions. As the sun comes out, the lens darkens. On the flip side, as clouds roll in, the lens lets in more light. To test this claim, we covered up one side of the goggles on a sunny day for 30 seconds. Sure enough, where our hand had blocked the light, the lens was lighter than the other half that remained under sun exposure. You won't notice the changes throughout the day skiing, but you might notice that your eyes aren't strained and visibility remains optimal as light conditions change. These weren't the only photochromic lenses tested, but they seemed to react to changing light conditions the most dynamically. In our experiences with this model, the lens kept our eyes happy, and visibility was fantastic in a wide range of conditions, from light storms to partly cloudy to mostly sunny. Even with such an adaptable lens, being unable to swap lenses is still a drawback when presented with splitter bluebird or epic whiteout conditions. Especially when spending $240 for a pair of goggles, we'd also appreciate a pair of lenses. The lens is removable, but that's not very helpful because Julbo USA doesn't sell replacement lenses for their goggles. The view through the Snow Tiger lens of the Aerospace in partly cloudy conditions. We love the idea of never needing to swap lenses. Bringing a spare lens in a ski jacket pocket or pack is plain annoying. While Julbo is moving closer to creating a quiver-of-one lens, the visibility during an intense snowstorm was a bit lacking, as on piercing blue sky, sunny days. At these extreme ends of the visibility spectrum, we preferred light condition-specific lenses. Bottom line — this single lens will likely perfectly suffice for 90% of your days on the mountain. Julbo sells these goggles with several lens options, some of which offer a wider range of adaptability to light conditions. If purchasing again, we would likely opt for one of these different lenses, like the Zebra Photochromic. But then again, we love the red and blue look that only comes with the Snow Tiger lens. The Julbo goggles are comfortable enough to wear from open to close at a resort, but they weren't the top dog for face feel. The three layers of foam provide plenty of cushioning, but the brushed layer that touches our faces wasn't our favorite. While soft, it was noticeably scratchier than other models that scored higher. Noticeable, but not awful. This was the chief drawback for comfort with this model. Keep in mind, opening the vents can let in a cooling breeze that other models can't do, which increases comfort when charging the slopes on warm days. The three silicone strips running along the inside of the strap function fine to hold the goggles in place on a helmet, and the dual plastic adjustment pieces are simple enough to fine-tune your desired tightness. The dual adjustment pieces also mean that they live comfortably on the side of your head, not directly in the back where the pressure can cause discomfort. This subtle comfort factor is noticed only in situations when not wearing a helmet, such as backcountry ascents and midday beverage breaks at the resort. We were happy to use this pair all day at the resort, but can't declare the face fabric our all-time favorite. It was slightly itchier than other models. If this is the most important metric to you, these goggles demand to be on your short list, especially if you're a backcountry skier. Julbo offers a revolutionary concept, dubbed the SuperFlow System, in the Aerospace's movable lens design. Pull outward on the tabs on the four corners of the goggles to move the lens up to one centimeter away from the frame (while remaining connected via plastic hinges). This provides the most ventilation of any model we have ever tested by a landslide. Moving the lens away from the frame is easy to do while wearing gloves and proved extremely effective at clearing any fog formation on the inside of the lens. When skinning up to backcountry objectives, we were able to wear our goggles the entire time. The Aerospace also ships with a plastic guard that clips to the top of the lens when in open position to block snow from sneaking in from the top. We only recommend using this attachment if there is considerable precipitation, though, as it's somewhat annoying to attach to the goggles and, being a small black piece, it's easy to lose. If you often tour in cold, precipitous conditions, the ventilation capabilities of this model allow you to leave your sunglasses for the ascent at home. If you opt for goggles on the ups, this pair is your match, allowing you to leave sunglasses at home (one less thing in your pack!). Of course, no amount of ventilation is going to offset the fact that working hard in warm conditions makes foam padding uncomfortable. For warm, heavy-sweat skinning action, we still prefer to bring our sunglasses for the ups and goggles for the downs. Not only useful in the backcountry, we loved popping out the lens on warm, sunny resort days. The increased airflow is mega-welcome when waiting in lift lines. A minor feature of the lens extension system is that the lens tilts from one side to the other. If the wind is blasting from the side, close the lens on that side while leaving the opposite side open for eye protection from the wind and ample ventilation simultaneously. We expect other goggle manufacturers to imitate the SuperFlow design in the future. Push on the top corners of the frame to snap the lens back into place. Due to the unique pop-out adjustable lens design of the Aerospace these goggles have a unique lens attachment system. The lens attaches only to the pop-out arms with notches at the top and bottom of the lens that snap into this movable part of the frame. Julbo doesn't sell replacement lenses for the Aerospace, instead, they hope their photochromatic lenses can adapt enough to work in a broad range of light conditions. This means you don't need to remove the lenses regularly, if ever, except possibly for cleaning. You'll probably never need to change the lens on the Aerospace, but you can.. 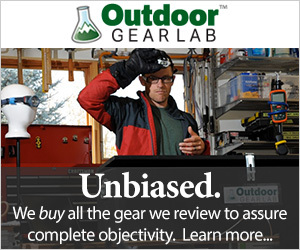 This is the metric where we were most skeptical of the Julbo goggles. With the plastic hinged parts behind the lens-extending technology, there are more points for potential failure on the Aerospace in comparison to its peers. Also, impact when the lens is extended, while unlikely, would probably put this model on the disabled list. One of our testers nailed a beautiful landing on his face in these goggles, though, and they survived without flinching. The front of the lens itself, though, did receive more scratches than some other models by the end of the testing period. We did, however, like the included stuff sack that comes with the Aerospace, particularly for how well it protects the goggles when crammed in a backpack or luggage. There is a curved, plastic shield encased inside the fabric to protect the front of the lens from hard knocks and to help keep the frame's shape when compressed. Another point for Julbo's design team for combining hard case protection with the convenience and packability a fabric case. We tested the Snow Tiger version of the Aerospace, which brings a brightly colored pop to a skiing outfit. The lens in the closed position looks better than open, but we doubt many will care or notice. This pair looks most similar to the Zeal Nomad with a large spherical lens, a thin frame around the perimeter, bold colors, and a mix between large, modern designs and more traditional frames. In style smiles and palm hits during a backcountry transition near Lake Tahoe, CA. The Aerospace is a great pair of goggles for the ups and downs of backcountry ski tours where the need for premium ventilation can make a huge difference, increasing comfort and visibility while decreasing frustration. Also, folks who never carry their spare lens around (or constantly forget/lose them) will appreciate the self-adjusting technology of the REACTIV lens. Focus on the fun, not your foggy goggs, when you don the Aerospace. If you utilize the innovations of this $240 pair of goggles, then justifying the above-average price tag isn't too hard to do. However, if you don't need a technical model, save a great deal of cash by going with a simpler yet sufficient model, such as the Smith Squad ChromaPop. We loved wearing the Julbo Aerospace goggles no matter what our mountain mission was. It didn't suffer any major drawbacks and provided unique innovation in a market flooded with similarity. Due to its price, it's not the best choice for the average resort skier who doesn't need a techy pair. However, if you hate changing lenses or put a high price on breathability, this is our top recommendation. Julbo makes the Aerospace in seven different frame/strap color options and with several different Reactiv Photochromic lens options. Julbo also makes an over-the-glass (OTG) version of the Aerospace that is designed to be compatible with glasses. For those of you who are interested in the ventilation of the Aerospace but don't want to pay the premium price for the photochromic lens, Julbo makes the Airflux which is basically the same goggle with their Spectron lenses. The Airflux ranges in price from $125-$155. MooseJaw $219.99 - 6% off!